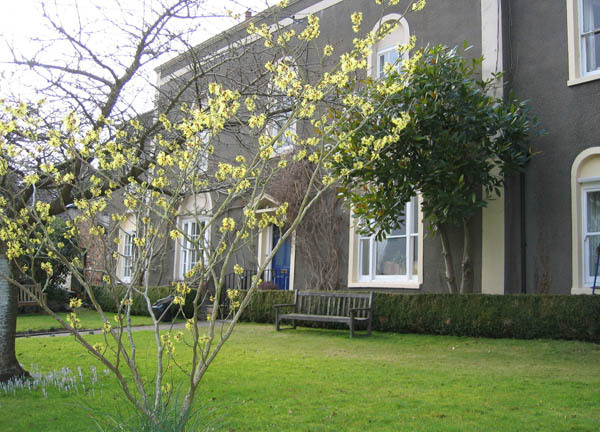 Lampton House Residential Care Home is an attractive 18th Century former vicarage half a mile from Long Ashton village and only two miles from Bristol City Centre. We provide for the elderly and the Care Quality Commission has given us a 'fully compliant' rating. 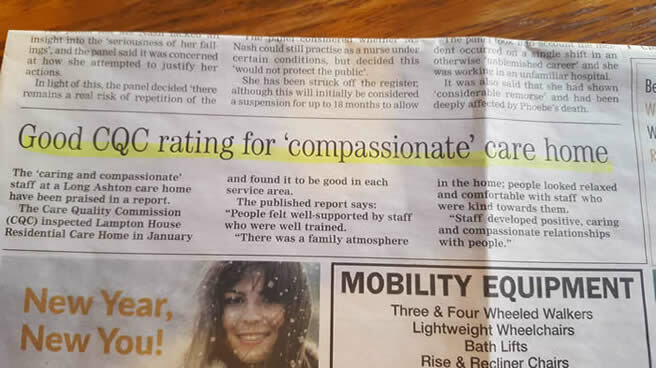 We do not provide nursing care. We provide a safe and secure home for our residents where their wellbeing and comfort are of paramount importance. Our manager, Annie Clough, leads a team of experienced and long-serving carers.Our staff display respect and patience at all times. 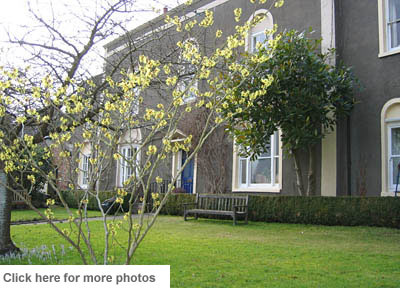 We have lovely gardens and private parking. All our bedrooms have an en-suite wc and some also have an en-suite shower. Every bedroom is equipped with an emergency call bell, a television and telephone and we have Wi-Fi throughout. Prospective residents are welcome to spend a day with us, if they can, to meet our staff and residents. Our rooms are fully furnished but we can make space for any items of furniture a resident wishes to bring with them and, within our locality, we are offer a collection service for these items. Residents can also move rooms once in the home if a preferred room becomes available. 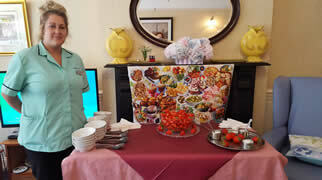 We don't have visiting restrictions and visitors are welcome to dine with residents at any time. Residents have their meals in their rooms if they wish but we do encourage everyone to come to the dining room if they can. Lunch is the main meal of the day and we have a daily menu. Residents may have a snack or drink at any time of day or night. We also have mobile shop which sells toiletries, confectionery, cards etc. Our activities team organise daily entertainment and activities and our gardener runs a weekly gardening club. Residents who want a change of scenery can enjoy a car ride to local places of interest or attend a service in the local church. Our activities team helps with personal shopping, outings, appointments and maintaining contact with family and friends and we have a laptop computer which residents can use to Skype friends and relatives anywhere in the world. Our hairdresser visits weekly and we have an excellent local GP practice. Other healthcare professionals (physiotherapy, chiropodists, opticians etc.) also visit regularly. Congratulations to all the staff at Lampton House, who have received a lovely write up in the local paper for their work! Dates for you diary. Fortnight commencing 5th March 2018. Monday - Enjoy a Manicure with Jessica while watching a movie from 2.00pm. Tuesday - Music and Movement with Samantha. Friday - Join Celia for Prize Bingo in the Top Lounge from 2.30pm. Monday - Rick Hensey will be in the Bottom Lounge from 11.00am. Tuesday - Celia will be holding her Craft Session Top Floor Lounge from 2.30pm. Wednesday - Our Hairdresser, Nikki, will be in today from 9.00am. 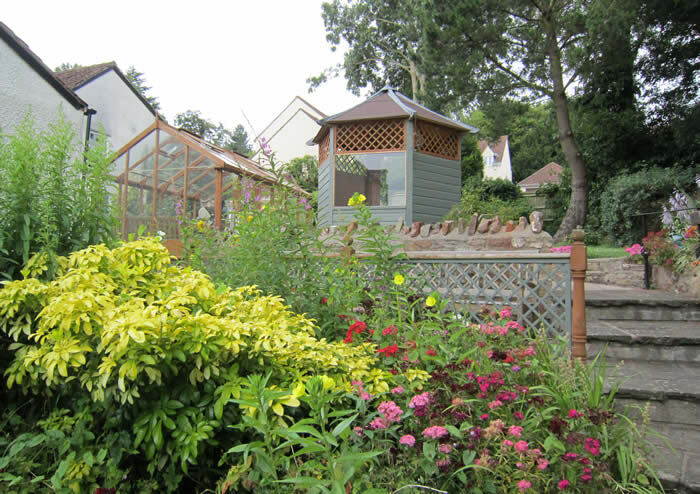 Thursday - Gardening Club with Steve Green from 11.00am. Friday - Join Celia for Story Time and Activities in the Bottom Lounge 10.15am. Saturday - Friends of Lampton for Tea & Coffee in the Top Lounge 3.00pm. We offer short stay and respite care. Respite care can allow someone to recuperate after a spell in hospital or give family carers a break. New friendships are made and we often see respite residents more than once! Most of our residents are self-funding but local authorities offer financial assistance to individuals with capital /savings below £23,500. There are several benefits available for self-funding residents and our financial manager, Christine Bowers, is happy to offer informal advice to prospective residents in connection with any funding issues - please feel free to call her on 01275 374669. Single room with en-suite WC and vanity basin and shower £575-695 per week.